833 civilians suffered from mines since the beginning of the hostilities in the Donbas conflict zone. Head of the department of environmental safety and mine action of the Ministry of Defense of Ukraine, and Colonel Maksym Komisarov stated this during the session, as the press service of the Ministry reports. “The most complicated situation is on Eastern Ukraine, as explosive remnants kill and injure people. 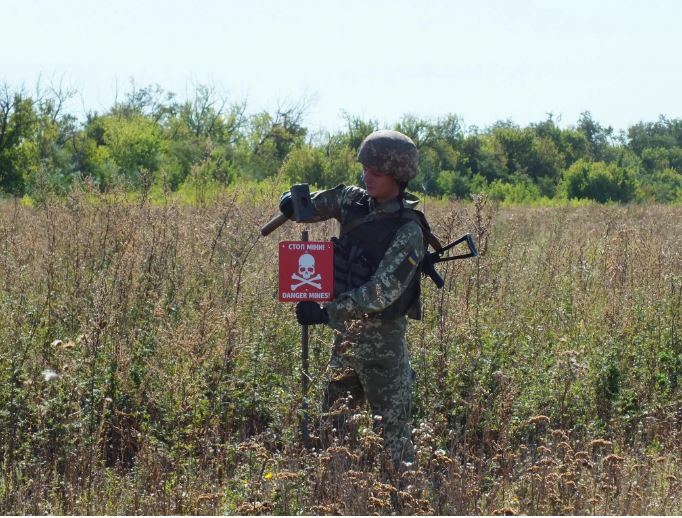 Thus, since the beginning of the Russian aggression in Donetsk and Luhansk regions 833 civil citizens suffered from explosions of mines and explosive remnants, 269 people died, 556 were injured, and among them were 125 children: 27 died and 98 were injured”, - Komisarov said. According to the Colonel, almost 16 square kilometers of Luhansk and Donetsk regions, including the temporarily occupied territories, contain such mined areas, which are dangerous for the common people. “Unfortunately, this topic remains urgent for five years in Ukraine, as its territories are one of the most contaminated with explosives things in the world”, - the Head of the department of environmental safety and mine action added.